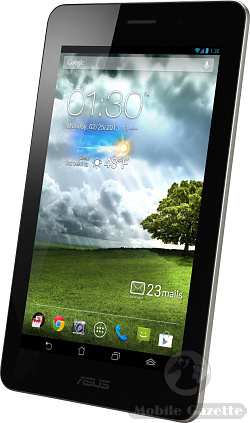 The ASUS Fonepad (not to be confused with the PadFone) is a Intel-based 7" Android 4.1 tablet which seems to be pitched at the lower end of the tablet market. The single-core 1.2GHz Intel Atom processor isn't the fastest thing in the world, but it should be good enough for most applications, and perhaps more importantly it is quite a cheap component. Inside is 1GB of RAM and 8GB or 16GB of internal flash memory plus a microSD slot. The display is a 7.0" 800 x 1280 pixel IPS panel with wide viewing angles, but it isn't a full HD display, nor does there seem to be an HDMI output. Still, that's a pretty typical resolution for this type of device and it should suit most users. Also on the front is a 1.2 megapixel camera for video calling. Unlike some other tablets, the ASUS Fonepad can be used for making phone calls, although we would suggest that perhaps you would want to invest in a Bluetooth headset rather than tying to lift this fairly hefty beast to your face every time you want to speak to someone. The Fonepad supports quad-band GSM and UMTS calling, it can also support HSPA+ data downloads of up to 21 megabits per second. Of course, it also supports WiFi, Bluetooth and USB connectivity. There's a full set of sensors onboard, including GPS and GLONASS positioning systems, an electronic compass and accelerometer plus a proximity sensor. You could use the Fonepad as an oversized SatNav if you wanted to, assuming you could find a big enough mount. The Asian and European models are a bit different. In Europe, the Fonepad has a suggested retail price of €219 for a 16GB version with no rear camera, in Asia the recommended price is US$249 with 8GB of storage and a 3 megapixel rear camera. If these prices seem a little expensive, remember that you can slot a micro-SIM card directly into the Fonepad and use it anywhere. Inside the Fonepad is a beefy 4270 mAh battery which is quoted as being good for up to 9 hours use. The Fonepad measures 196 x 120 x 10.4mm and weighs 340 grams. 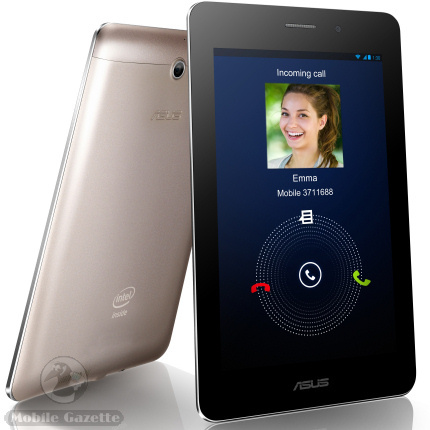 ASUS say that the Fonepad should start to ship globally from March 2013 onwards in Titanium Gray and Champagne Gold colour schemes.